Remy Millott, CEO of GYG, outlines why its specialised Technocraft technology is changing the industry’s approach to paint projects. Most people in the superyacht industry are aware of our TECHNOCRAFT scaffold and containment business. When you walk in to a shipyard and the first thing you see is a line of 70+m yachts cocooned in 140 tons of scaffold and shrink-wrapped plastic, it’s hard to miss. 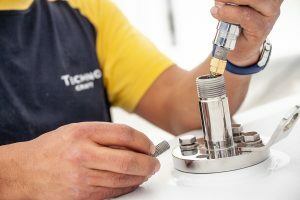 People are less familiar however with TECHNOCRAFT’s Yacht Hardware Solutions division, which handles the inventory, removal, repair and re-installation of all yacht fittings, an essential part of a major re-paint. When first contemplating a re-paint, it is easy to underestimate the sheer extent of what is involved with the removal of the fittings. To the untrained eye it may appear to be just a few lockers, light fittings and hand rails but in reality, even on a 40m boat, the job is far more complex. When a project is scaled up to a 90+m superyacht, the process may involve around 2-2,500 individual pieces of highly valuable and complex fixtures that all need to be inventoried, mapped, tagged, removed, shipped, dismantled, inspected, repaired or replaced, cleaned and/or painted, stored, re-shipped, re-fitted, tested and signed off. This is no mean feat. Such a process requires thousands of man-hours from a team of highly experienced and qualified technicians all of whom must coordinate their activities with those of the other refit teams. The process starts with an inspection survey not only to identify the scope, location and volume of the fittings but also to verify any non-standard fittings or equipment that may require specialised tools or lifting equipment to remove. The involvement of independent specialist teams to handle electronics or registered safety equipment may also be required. This inspection is handled in collaboration with the yacht’s deck and engineering teams as well as technical project managers to ensure effective knowledge transfer and to identify any pre-existing defects. As with all aspects of the refit, the planning phase is crucial to a successful outcome. The fittings removal process is always on the critical path of a refit project as other teams cannot engage until all the ships valuable assets have been safely removed. This process is one of TECHNOCRAFT’s strengths as the containment and hardware teams come from the same company with fully integrated methodologies enabling schedule optimisation and seamless coordination. As any shipyard project manager or paint consultant will confirm, the cohesion between the project teams is vital on any major refit project. When it’s not right, schedules slip. Contracting a turnkey solution from a fully integrated company like GYG which has the specialist containment, hardware and painting teams and can deploy to virtually any yard in the world is a major benefit as it significantly reduces the risk of falling behind schedule. There is also added value in having a seamless global warranty; when independent contractors undertake each phase of the work separately there are hand-offs which, when problems arise often lead to disputes about liability. With a turnkey solution from GYG these risks are removed. Typically, the two teams of specialist technicians deploy simultaneously, working in a highly coordinated fashion to construct the containment system in parallel with the removal of the fittings to minimise the elapsed time before the paint and other refit teams can start work. On a 90m boat this is typically around 14 days from the day the yacht arrives in the shipyard. If the refit is taking place at or close to one of GYG’s hubs (Palma, Barcelona, La Ciotat) the TECHNOCRAFT hardware team will transport the yacht fittings to one of their bespoke maintenance and storage facilities. If it’s a remote location TECHNOCRAFT will ship special containerised workshops and stores to the shipyard with its teams to provide the necessary facilities and equipment on-site. This means they can deliver a seamless service and maintain schedule irrespective of location. Once each piece of equipment has arrived at the TECHNOCRAFT workshop it is carefully dismantled, logged and inspected before being channelled to the different technical teams for cleaning, repair, painting or replacement. This is a complex and painstaking process that requires an artisan approach to carefully restore each piece to pristine condition before it is packed and stored ready for re-fitting. The reinstallation process is even more challenging as each door hinge must be adjusted to adapt to the newly fitted seals to ensure a perfect closure. Once complete, every item is tested, inspected and approved by the shipyard project manager and the yacht team. The end to end process represents a colossal amount of work, typically several thousand man-hours on a large superyacht. It requires the same level of attention to detail as restoring a vintage motor-car and the speed of a Formula 1 style pit-stop where every second counts and accuracy and precision are paramount. This is why I regard the TECHNOCRAFT Yacht Hardware Solutions team as one of the most valued albeit unknown entities in the GYG organisation. Hopefully with the launch of TECHNOCRAFT’s new brand identity its profile will grow.